In a sport where talent and fitness are so closely linked, it’s no wonder boxers are in such great shape. For a fighter how well prepared and his level of fitness usually determines the outcome of the fight. That’s why fighters take their training so seriously. I will always bet my money on the more conditioned fighter over the more talented fighter. Even though you may not be planning to walk into the ring any time soon, that doesn’t mean you can’t train like these champions. Today and every day I invite you to bring that fighter’s mindset and work ethic into your training. Training is where the mind, body and HEART are tested. Today we focus on boxing cardio training, but the mindset and discipline will transfer to any aspect and style of our training. 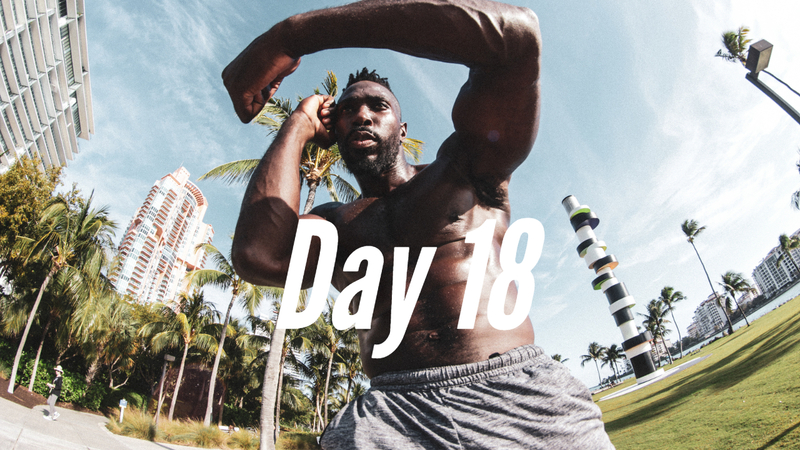 So without further delay, this is Day 18 – Let’s fight for it! Commit to 30 days of being healthier and being a better you. Ignore the distractions and the frustrations. Be patient, the results will come. JUST DON’T GIVE UP! For my more advanced members, try to repeat the series until you burnout. Also, feel free to mix and match with some of our previous videos. There are no rules! Get empowered, beat the gym, and let’s have some fun! If you want to, use our hashtag #BeatTheGym, let’s hold each other high and accountable and let’s celebrate one another’s milestones. If you are interested in going on the 30 HIIT Day Journey, please know that this program is free and will be available for you all year long. Sign up here! Standing Rotational Punch – This is a great exercise to get started with. This exercise targets the muscles running long your rib cage called the serratus anterior, and strengthening it will boost your rotational power and boost strength in your core and shoulders. To do it, first stand with your feet at shoulder-width and your hands in front of your ribs with your palms facing each other. Then rotate your torso to your right, pivoting your left foot as you punch straight out from your shoulder with your left hand. Now rotate to your left, and continue alternating sides. Jumping Jacks – By now you probably know this is one of my go-to warm up exercises. Remember to maintain a slight bend on the knees. Begin with your feet together. Then jump and open the arms and legs out to the sides. Your arms should come above the head and legs wider than shoulders. Then jump again and bring your legs and arms to the starting position. Slide to Rotational Punch – For this one we will we will repeat the same movement as in the standing rotational punch but now we will incorporate a swift slide. Footwork is a key skill to master as it plays a massive role to becoming a good fighter. The first action is to push from the back foot, this foot provides the drive to thrust the body to the left. Lift the front foot slightly, allowing the power generated from the push of the back foot to shift the body in a straight line to the left. Simultaneously release the punch as you did in the standing rotational punch. Slide to Upper Cut – This is the most powerful punch in a boxer’s arsenal. To throw an effective upper cut first bend your knees slightly the power will come from your lower body and the thrust generated from the side slide. Then rotate your hips and pivot your foot as you release the punch in an upward motion towards your opponent’s chin. Twist with a Punch – This is a slightly more challenging crunch variation. Start laying on your back and bring your hand up by your ears with your elbows wide. Contract your abs and bring your belly button down to raise your shoulders off the ground. At the same time, using your obliques, twist your upper body and release a cross punch. Repeat the same crunch motion alternating the twist side. Overhead Punches – Overhead punches are the perfect conditioning exercise for any fighter. Execute them fast, with your knees bent and you will also activate your quads. First, stand with your feet hip distance apart with your hands directly in front of your shoulders and your palms facing inwards. Exhale alternating controlled punches with your arms overhead keeping your palms facing each other. Focus on breathing and keeping a strong and engaged back and core throughout this exercise. Deep Squat to Rotational Punch – This exercise is a more challenging and more dynamic variation of the bodyweight squat. First, start in a squat position, with your feet shoulder width apart and your toes pointing forward. As you stand up, shift your weight to one leg and punch with the opposite arm. Then, squat and repeat alternating sides. Remember to keep your hips back and your chest up. Jab-Cross Shuffle – Most important is to maintain a boxing shuffle and keep your legs and body moving in a back and forth motion while standing in a fighting stance. This move is composed of a jab- cross-jab-cross combo. You will throw a jab with your lead hand, simply twist your body slightly while rotating your fist and extending your arm straight in front of you and transferring your weight to your front foot. Then you will throw the cross, a straight punch with your rear hand. Double Slide to Hook – For this move we will slide twice to one side then keep your body straight and in a normal boxing stance. Pivot the front foot to generate power, then rotate your whole body and release the punch; shoulders and hips should move in unison. Remember to keep your arm bent at a 90-120 degree angle and aim the punch at your opponent’s chin. Toe Touch Crunches – This is one of the most effective abdominal fat burning exercises. Lie down on your back with your knees slightly bent and your feet on the ground, try to reach for your toes with your opposite hand. Alternate right and left. For additional difficulty keep your legs off the ground. Jab-Cross-Hook – Here we’re repeating some of the same moves as before and adding the hook punch. Remember to maintain your hands up to protect yourself, maintain a fighter’s stance as well as a boxing shuffle. Rapid fire feet – This is a fast paced workout and a great cardio exercise to promote agility, athleticism, and burn fat that targets the core, abs and legs. Start by standing with your arms at the chest, your knees slightly bend in a basketball guard position. Alternate running fast in place, stay on the balls of your feet and keep your hips low while moving as fast as possible. 30 Day HIIT Challenge - Day 30 – Workout Mash Up! 30 Day HIIT Challenge - Day 29 – Holy HIIT! !